IoT means Internet of things. It is a technology which connects different things (devices) all over the world through internet. So the devices which are located at different locations can be monitored and controlled from anywhere at any time, and devices can also communicate with each other. By the 2020, the electronic industry people are expecting that 50 billion devices are going to connect all over the world. internet of things (IoT) world is huge and mass technology, connectivity of things, huge storage of information, retrieve of information ineffective and secure manner. But because of the cloud connectivity and internet of things Big data solution come together to make reality of the IoT emerging. internet of things meaning is simply nothing but the internet of every thing or web of things. How this IoT technology is evolved? Due to globalization, everything is changing, culture, tradition, interest, hobbies and technology in every country and in all aspects. Change in technology is very drastic because this change is diversifying to all fields (electronics, robotics, automobile, bio-medical, agriculture, artificial intelligence etc.,) of science. Internet is one of the wonderful global connecting technologies which brought the mankind life busy by engaging with a lot of things around the world. This emerging technology (IoT - internet things) will bring a great change in the lifestyle of the mankind. When discussing such huge and mass technologies, there will be a question arises in our mind “how and when this IoT technology is evolved”. In this generation, the internet connects different people all around the world through social media websites like Facebook, Twitter, Orkut, Whatsapp, etc., We make friends through any one and anywhere in the world. In this generation, a lot of things are going to be connecting all around the world. Here things may be mobile phone, Wifi-printer, vehicle control systems, house hold fans, lights, energy meters, etc., Machines are going to communicate with each other, machines can be monitor and control from remote locations at any time. In this iot world, a huge amount of data to be processed and stored. For purpose, big data technology came into picture with big estimations. Data Acquisition is the key term used in sensor interfacing devices, if a system has ability to collect or acquire the pieces of information from different sensor interfaced devices located at remote locations. For example, consider a power plant industry, where the people continuously acquire and monitor the parameters like temperature, pressure, power and displayed them on a monitor. Supervisor control in SCADA is a control system through which we can take control actions on the entire systems based on the acquired data. For example, switch ON the cooling fan in an industry when the temperature recorded on the display is higher than the threshold value. SCADA most often finds in industries like power, gas pipelines, oil purification, water distribution, etc. so that SCADA mostly specific industry automation by following specific protocols in industry standards. Whereas coming to IoT, here also we connect, monitor and control the devices over long distances through internet. Unlike SCADA, IoT is not limited to industries or not limited to four wall rooms, but it extends and connects different fields of science. For example a driver in a car can monitor the traffic status on the highway throughout his journey and take actions according to that data. Another example, a user can monitor his house hold power usage and can control from remote location. Because of every new emerging technology, there will be good things and bad things for mankind. Generally some people misuse the technology, and they can steal or modify others information. In IoT technology concern about Security issues will be a big deal, because hackers may breach the security levels and may control the devices without any proper permission. Someone can hack into my television, refrigerator, CCTV cameras and can control these. Along with IoT, other sectors of technology are going to connect to internet and make the IoT huge and Strong. For example, vehicle to vehicle communication is next generation transportation for safe driving, traffic monitoring, etc., but because of IoT, hacker may hack into my car and controlled, which will put me into danger. Another example for IoT merging other technology is smart meter and smart grid solutions, what happens when some hack into the power grid control system and shut it down and makes the city black out for days until the problem is resolved. Which in turn a big revenue loss and disturb the regular human life. So that the people who develop and use IoT must have some safeguard solutions, to answer such questions. IoT Is mainly concern about the device connectivity through internet. So every embedded device should be capable to support of internet connectivity, this may be achieved by providing add on support to Ethernet and wifi connection. In this direction, different chip design companies (like Texas instruments, Intel, Renesas, Infineon, Freescale semiconductors, etc.,) are trying to integrate these (Ethernet, Wifi, etc.,) features in their chips. A lot of new protocols and standards are introducing for developing Embedded IoT applications. MQTT (stand for MQ Telemetry Transport) is one of the protocols used for Internet of Things connectivity, which is developed by IBM Company. It is a publish/ subscribe messaging protocol for IoT. Texas Instruments Company who developed the first successful microcontroller with integrated Wifi Subsystem with ultra low power capability called ‘CC3200’ with 9mmX9mm size. Designing such chip with mix of analog, and digital and RF is a big challenging task, but the Texas Instruments make it real. Building IoT Application using CC3200 is easy and can be readily applied to our applications. CC3200 contains ARM cortex –M4 core with 80MHz clock and also in-built wifi along with integrated hardware crypto engine for fast security implementation on Embedded IoT applications. This chip also got product of the year award in 2014 from electronics products magazine. 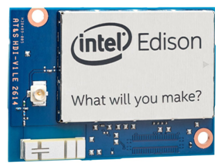 Edison is another MCU with integrated wifi subsystem which is developed by Intel Company, the SoC includes a dual core, and dual threaded Intel Atom CPU at 500MHz and Intel Quark microcontroller at 100MHz. But for simple embedded systems like controller house hold applications, this will be a big and costly product. It suits for high speed and real time applications like V2V communications. This SoC comes along with in-built Bluetooth for sensor networks. Almost the today’s world is covered with full of different embedded systems but no connectivity between them. IoT brings the connectivity between the embedded systems in different fields of technology (medical, house hold, power sector, consumer goods, etc). 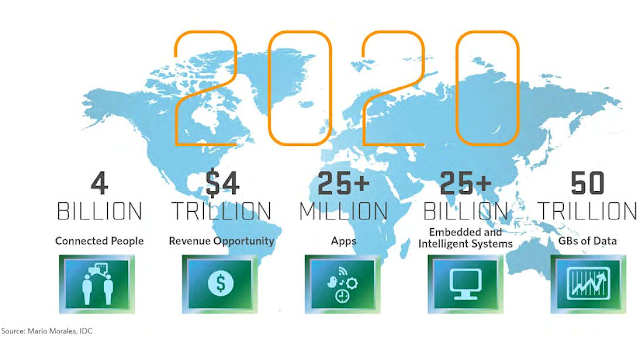 IoT brings a new era in embedded systems and because of IoT a massive demand will gain by the embedded systems, Chip design technology (VLSI) and software industry for web application developments, online data base management, etc., A huge market will be going on embedded systems design and intelligent systems all over the world. IoT security needs to be taken seriously, particularly before businesses start to connect mission critical devices and systems. Nice Post. Keep sharing such kind of Wonderful information. Very usefull content. thanks for posting dude. Or you possibly can set your private home safety system through your cellphone. Or you possibly can lock your car utilizing your cellphone or handheld machine. In case you're tech savvy sufficient, you should use a handheld machine to trace and set up the whole lot you deem vital sufficient to trace and set up.This is great blog. If you want to know more about this visit here Internet of Things. Fantastic post, full of useful information and I really like your style of blogging.Please check out my site for VLSI Training. Great blog really awesome information has been shared by you. Good job. Please dont stop this work. Keep updating the informations.